“Liam was a little over three when he was diagnosed with autism. My daughter, Mary Bridget, was two. At first, I couldn’t see it in Liam. He just seemed clumsy. I used to say instead of hands he had paws,” Long explains. “He was a happy child, but he spent hours spinning the wheels on the dishwasher rack or the stroller.” Bridget was completely different. Long’s daughter screamed for the first two years of her life and was hyper-sensitive to sound. Long is among the growing number of parents with autistic children. In the United States, one in 110 kids are diagnosed. In North Carolina, the number is higher, one in 97. Each year, the State Department of Public Instruction counts the number of students with autism. During the 2004-2005 academic year, there were 5,341; in 2009-2010 the tally doubled to 10,664. David Laxton, communications director for the Autism Society of North Carolina, explains one reason the numbers have increased is children are being diagnosed earlier. “Parents are better informed. They’re more knowledgeable about childhood milestones, so they’re quick to notice if the milestones aren’t being met.” There are other factors as well. “Pediatricians are better equipped, too, allowing them to spot early markers of autism,” he says. Still, the statistics are sobering, and instances of autism grow annually by 10 to 17 percent, primarily in boys. The rise can’t be entirely explained by increased awareness, and the cause of the disorder is unknown. No two people are affected by Autism Spectrum Disorder (ASD) in the same way. It refers to a group of pervasive developmental disorders, including Asperger’s Syndrome and classic autism, the diagnosis given to Long’s children. All impact a person’s ability to process and understand what they see, hear, or otherwise sense. It can manifest as a delay in spoken language, lack of interest in peer relationships, and repetitive language or motor mannerisms. Long found those answers and hope in a therapy called Applied Behavioral Analysis (ABA). It’s the only treatment for autism recommended by the Surgeon General. Rachael Cushing, clinical director at St. Gerard House and Liam’s first ABA tutor, explains that the program used at St. Gerard House is one-on-one therapy that addresses each child’s needs. The guiding principle of ABA is to provide parents, educators, and children with tools that will aid the child in developing behaviors that allow them to participate and be successful with their peers in classroom and social settings. ABA holds that every behavior serves a purpose in accomplishing something for the individual. In a child’s case, this could be gaining attention from parents. With this method, a certified clinician assesses the why of behaviors and then develops a program to help that child change a negative behavior to a positive one and achieve the same outcome. Cushing has witnessed the results in her sister, Catherine, now 22 and a volunteer at St. Gerard House. She was diagnosed with severe autism as a child. “You couldn’t even make eye contact with her because it would send her into a tantrum that lasted hours,” Cushing says. Catherine is one of the first success stories of the ABA method, and now Long’s children are part of that success. Liam and Bridget, now 11 and nine, attend classes at Immaculata Catholic School, an accomplishment many experts told Long not to expect. 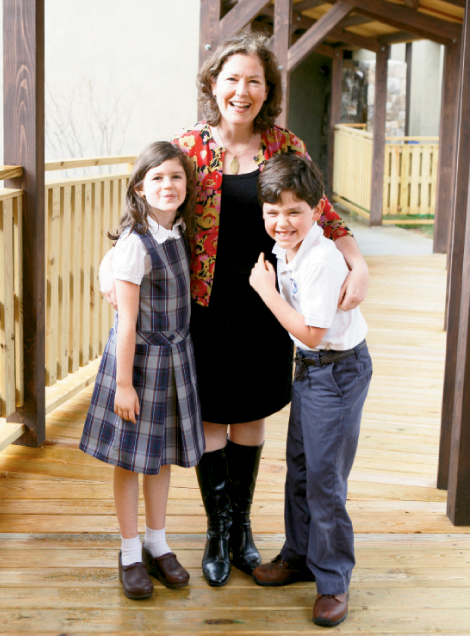 Long’s advocacy for her children was the motivation behind the opening of St. Gerard’s and The Grotto, which she founded in March 2010. “I wanted to be a one-stop shop; a place parents and children could come and get the help they needed under one roof,” she says. The center provides other services such as parent support groups, after-school programs, and behavioral assessments. The results show in the faces of children no longer trapped in a world of autism. In one instance, a student named Izaiah came to St. Gerard’s unable to communicate. A year later, he is chattering away, finally able communicate with his parents and others. The center is connected physically and in mission to Immaculata Catholic School, a private pre-K through eighth grade school. Immaculata’s preschool and seventh and eighth grade classrooms share a newly constructed building with The Grotto, designed specifically for the needs of autistic children. The goal is to integrate the schools as much as possible and for the autistic children to transition into the Immaculata setting or other traditional schools when ready. Long acknowledges that not all children will be able to make take that step, so her hope is that The Grotto, now licensed to serve children up to age seven, will grow to provide education through high school. Currently, six children attend the pre-school, with a teacher for each student. Tuition per child averages $40,000 annually and parents pay about a fourth of that cost. More funding is needed to allow additional kids—now on a waiting list—to attend. As director, this is where Long focuses her efforts. When asked if she ever felt like giving up, Long is reflective. “That just wasn’t an option. Every time I looked into my children’s eyes, I saw so much more than what I was being told was there. I knew there was more for them. There is more for every child with autism."